What’s going on with the Silver Lake Reservoir? What was once a wide, blue and scenic oasis in the city with a view of the San Gabriel Mountains and the surrounding hilly neighborhood has become an eyesore in the heart of Silver Lake. 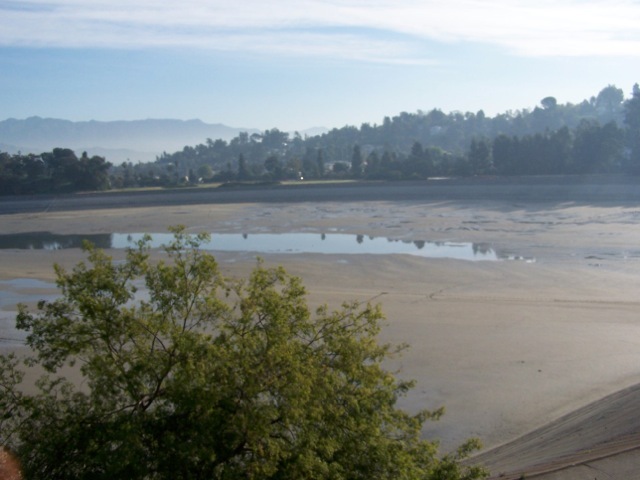 The Silver Lake Reservoir, consisting of two bodies called Ivanhoe and Silver Lake, has been drained for quite some time now. There’s no end in sight to the long drought, and it’s still unclear what kind of a solution city leaders will decide upon. According to the Department of Water and Power, the drought has caused refilling plans to backfire. A recent report cited a DWP official as saying that the utility has no idea where water to fill it back up will come from. The plan to drain the reservoir was drawn up close to ten years ago, way before the effects of the impending drought became apparent. Further complicating things, the long-awaited El Niño has turned out to be a major flop. There’s a few reason’s why it was drained. According to the Los Angeles Times, the reservoir was deemed sub-standard by Federal regulators for drinking water. Open-air reservoirs are now being phased-out in the U.S.
Also, there are new pipelines being built along the floor of the now-drained reservoir that will re-direct all of the new water lines to the new closed-in 110-million-gallon replacement reservoir by Griffith Park. That’s still a work in progress that won’t be done until 2017. 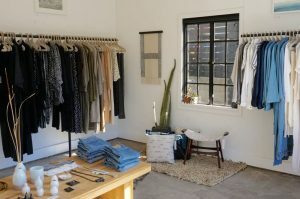 According to The Eastsider L.A., Mitch O’Farrell, Silver Lake‘s rep on the City Council, said it’s up to the neighborhood to decide what becomes of the big empty space. 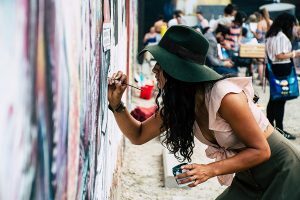 There’s a few competing groups with master plans, but none have really gained much traction. 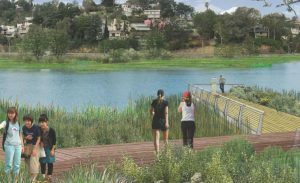 Silver Lake Forward, is pitching removing the fences with barbed wire and removing a much of the concrete and making a natural-looking body of water surrounded by new recreational areas. LAist provides a nice, condensed summary of their full plan. Another group, called Swim Silver Lake, wants to turn it into a swimming area called the “Silver Lake Plunge”. That plan only has 398 signatures on their website. For area resident’s– it’s really up to you on what you want this area to become. Sure, the city might be cash-strapped, but if you take some time to write letters and head to hearings on the reservoir, you’re more likely to have a say in the choice of what happens. Of course, we’ll have to wait for more rain until it look halfway back to normal.